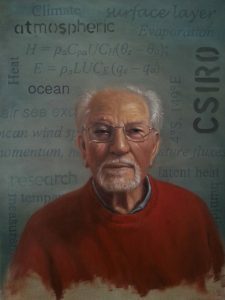 I painted my friend, Dr Frank Bradley, because he is one of an endangered species in Australia – the climate scientist. Frank played an important role nationally and internationally in the measurement of climate change. During the 1980s he led the way at CSIRO in the collection of accurate data on the exchange of moisture, momentum and heat between the ocean and the atmosphere – data which has been essential for accurate climate change modelling. I painted him in his favourite red jumper, a red warning flag, which fades away at the base of the image like evanescent climate experts. Across the blue-green grey background, suggestive of the oceans where Frank worked, float key fragments from his research – traces of his grappling with complex scientific problems. His formulae for Heat and Evaporation float above his head, together with the latitude and longitude where the most important data was collected. As climate change increasingly threatens us all, the work of scientists like Frank is essential. The portrait is my appeal for immediate, ongoing and generous bi-partisan support for climate science research.